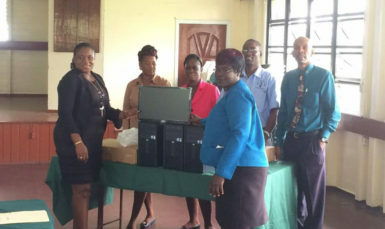 Assuria Insurance Company yesterday donated three computer systems to the Guyana Teachers’ Union (GTU) as the two look to strengthen their ties. Speaking on behalf of the insurance company, Orin Daniels explained that since October 2014 an important agreement was inked with the union to provide five types of insurance–health, life, motor, fire and travel–in a unique package that was designed especially for teachers. “….This is not offered for other institutions and the uniqueness is that for the fire and motor coverages teachers can pay on a monthly basis,” Daniels said, pointing out that for the normal packages payments would be paid annually or semiannually. Daniels explained that so far at least $1.4 million has been claimed by teachers and that the health insurance covers not only medical benefits but also dental. Assuria Insurance’s Orin Daniels (right) GTU’s Mark Lyte (second, right), Coretta McDonald (left) and others pose with the donations. “Assuria being a new insurance [company] in Guyana but the largest in Suriname has taken this partnership very serious and as a result in that in any way we can enhance the standard of living for the teachers and the Guyanese public as a whole we will try out best effort to make sure that happens,” he said, pointing out that the company is exploring the option of a television show with the union that would be called “GTU and U”, with the insurance company being a big sponsor. So far there are 306 teachers on the health and life insurance plan and about 50 on the motor and fire plan and Daniels said he is positive the numbers will increase as the partnership between the two grows. GTU President Mark Lyte expressed gratitude for the “timely” donation, which he said will go a far way in enhancing the work of the union.